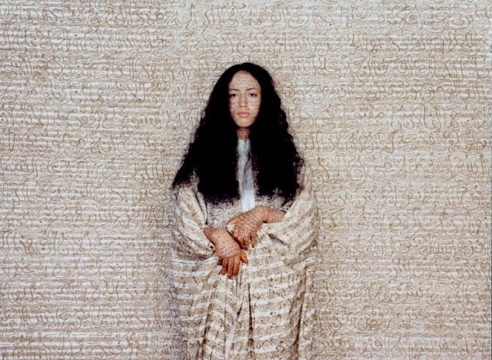 Lalla Essaydi’s art champions women. Central to the artist’s vision is a unique synthesis of personal and historical catalysts. As a Muslim woman who grew up in Morocco, raised her family in Saudi Arabia, and relocated to France and finally the United States, the artist has profound firsthand perspectives into cross-cultural identity politics. 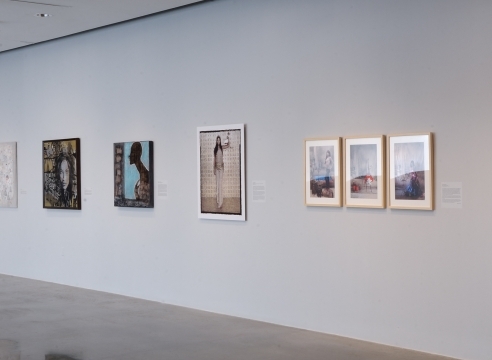 Weaving together a rich roster of culturally embedded materials and practices—including the odalisque form, Arabic calligraphy, henna, textiles, and bullets—she illuminates the narratives that have been associated with Muslim women throughout time and across cultures. 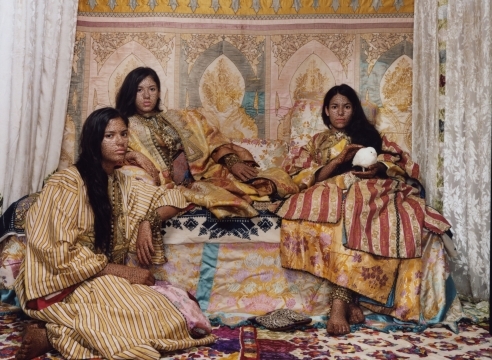 By placing Orientalist fantasies of Arab women and Western stereotypes in dialogue with lived realities, Essaydi presents identity as the culmination of these legacies, yet something that also expands beyond culture, iconography, and stereotypes. 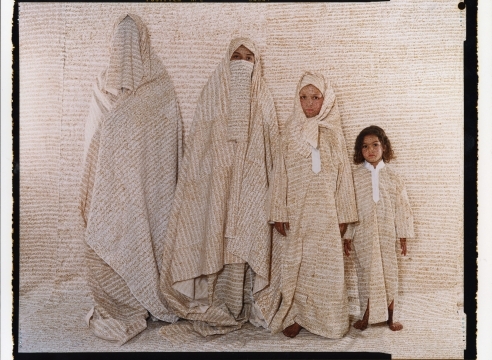 The performative act of inscribing women’s bodies and spaces with calligraphy is a vital part of Essaydi’s approach, emphasizing the ongoing, active, and collaborative process of becoming and creating. 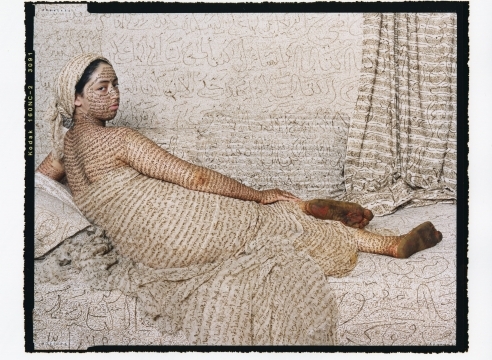 Since her first major series Converging Territories (2002-4), Essaydi has used henna to envelope the women in her photographs in Arabic calligraphy, a skill she could not learn in school due to her gender. Henna is a form of decoration that marks some of the happiest and most significant moments of a Muslim woman’s life, and Essaydi elevates this tradition—conventionally regarded as a “woman’s craft”—into a radical act of visual and linguistic artistry. The stream-of-consciousness, poetic script includes biographical details relating to the artist’s and models’ experiences as women. 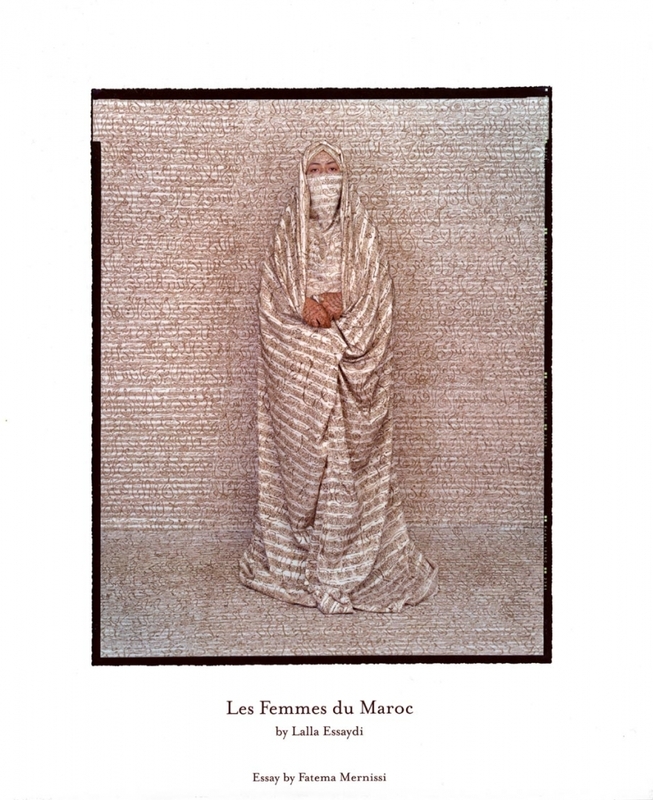 Essaydi’s series Les Femmes du Maroc (2005-7) continued to engage with these approaches while expanding to also question the historical representation of Arab women in the Western art canon, referencing the Orientalist imagery of 19th century artists such as Ingres, Delacroix, and Gérôme. Her reinterpretation is a strong statement of the power of artistic representation to influence identity. 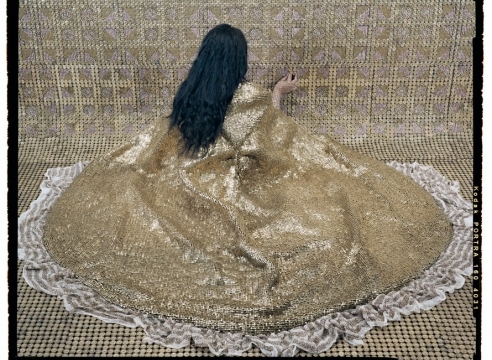 In her Harem series (2009), set in a lavish yet isolating harem in Morocco, Essaydi addresses the complex social and physical confines of Muslim womanhood. 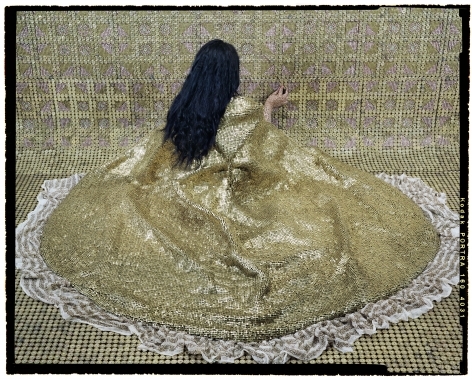 Her most recent series Bullets (2009-14) introduces a new material for the artist, silver and gold bullet casings, which she has woven to create glittering gowns of armor. 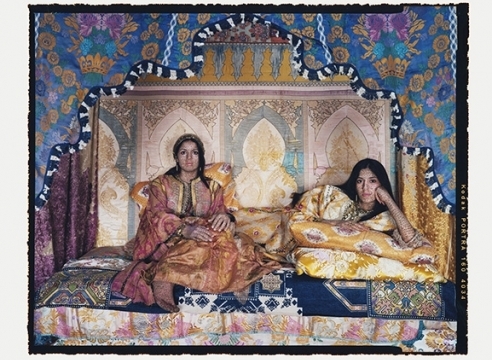 Essaydi spent her most foundational years living in traditional Muslim society in Morocco and Saudi Arabia. She attended École nationale supérieure des Beaux-Arts in Paris before earning her BFA from Tufts University and MFA from the School of the Museum of Fine Arts, both in Boston. 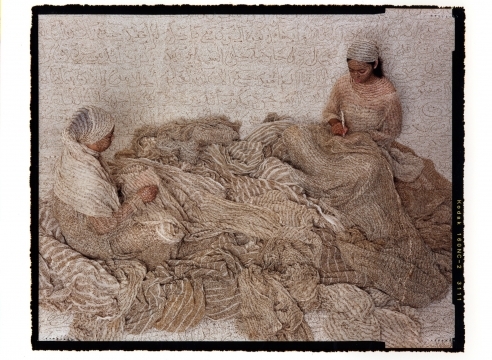 Her work has been exhibited around the world, including at the San Diego Museum of Art, CA; Museum of Fine Arts, Boston, MA; Bahrain National Museum; and Sharjah Calligraphy Biennial, United Arab Emirates. Essaydi’s work is represented in the collections of the Los Angeles County Museum of Art, CA; Art Institute of Chicago, IL; Museum of Fine Arts, Houston, TX; National Gallery of Art, Washington, D.C.; Brooklyn Museum of Art, NY; Museum of Fine Arts, Boston, MA; and the Louvre Museum, Paris, amongst many others. The artist currently lives in Boston and Marrakesh. From the Arabian Nights to the Arab Spring, Westerners see images of the Middle East in our own pop culture, news and art. But what does the region look like through the lens of local women? 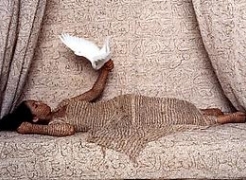 The exhibit She Who Tells a Story includes 85 images taken from the 1990s to today by a dozen female photographers from Iran and the Arab world. They aim to challenge Western conceptions and illuminate contemporary life and politics. Organized by the Museum of Fine Arts in Boston, the exhibit opens at the Canadian War Museum Wednesday and runs until March 4. 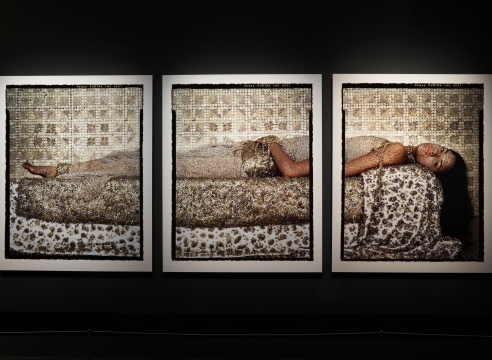 Moroccan-born Lalla Essaydi, a former painter and alumna of the School of the Museum of Fine Arts, Boston (SMFA), uses iconography from 19th century Orientalist paintings as inspiration to explore and question her own cultural identity. 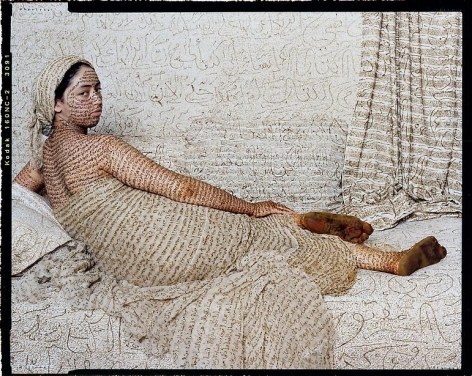 In the triptych Bullets Revisited #3 (2012), the most expansive work in the exhibition at 5 1⁄2 x 12 1⁄2 feet, she uses calligraphy (a typically male art form) to suggest the complexity of gender roles within Islamic culture. 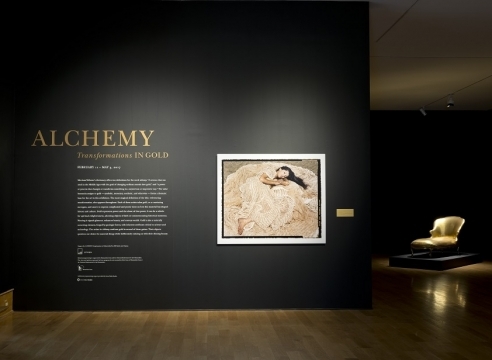 In Bullets Revisited #3, silver and golden bullet casings evoke symbolic violence, referencing her fear about growing restrictions on women in a new, post-revolutionary era that followed demonstrations and protests in the Arab world that began in 2010. "I Am," a traveling exhibition that has already stopped in Amman, Jordan and London, UK, aims to challenge such stereotypes and shatter misconceptions of Middle Eastern women through photographs, paintings, and mixed-media works that reflect their varied life experiences. 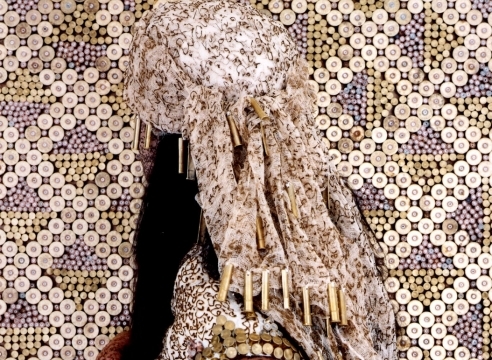 Lalla Essaydi's "Bullets Revisited #15" is included in the exhibition. 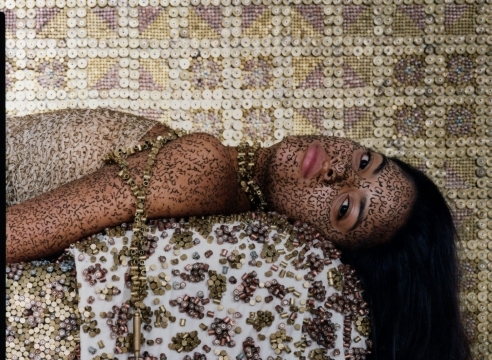 Moroccan artist Lalla Essaydi's "Bullets Revisited #3" is one of several works featured in the Akron Art Museum's upcoming exhibition, "Alchemy: Transformations in Gold." The exhibition travels from the Des Moines Art Center, where it was open from 11 February — 5 May 2017. The National Museum of Women in the Arts (NMWA) announces recent major collection acquisitions in celebration of the beginning of the museum’s 30th-anniversary year. Newly acquired works include Lalla Essaydi's Bullets Revisited #3 (2012), on view in "REVIVAL" from June 23 to September 10, 2017. 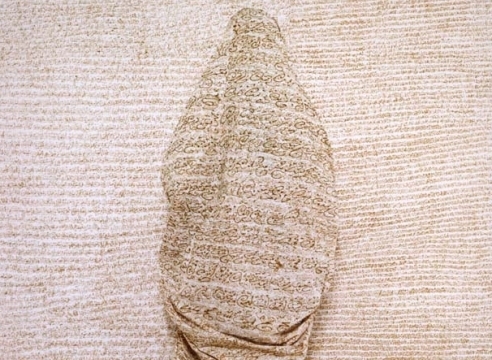 The show also includes Essaydi's Bullets Revisited #20 (2014) (pictured here). 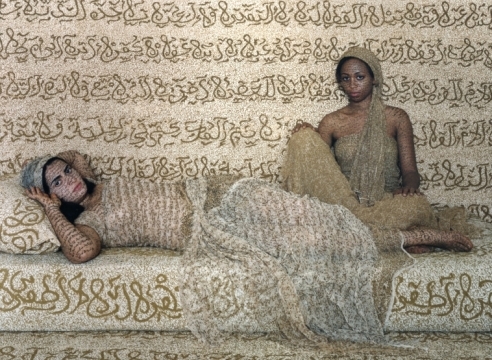 The depiction of Arab women in art is a relatively recent phenomenon. For centuries, it was unconditionally banned; the only existing representations were 19th-century European fantasies of women lazing in harems. 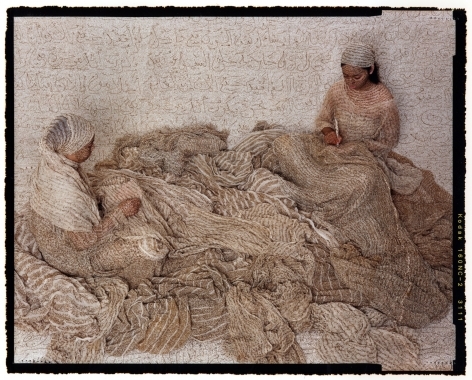 Now, women from the Muslim world appear frequently in painting, sculpture and photography, yet the issue remains fraught. A panel discussion at The New York Times Art for Tomorrow conference in Doha explored the subject of how Arab women are portrayed in art, with Lalla Essaydi, an artist who lives and works in New York and Marrakesh, and Touria El Glaoui, the founder of the 1:54 Contemporary African Art Fair and the daughter of the renowned Moroccan painter Hassan El Glaoui. 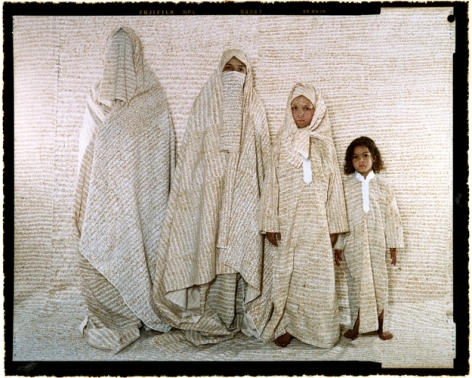 The work of photographer Lalla Essaydi sits somewhere inside the gaps Said felt so keenly. 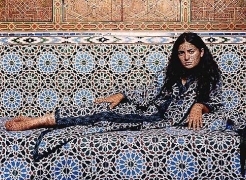 Part of a new wave of Moroccan artists enjoying success under the liberalized reign of King Mohammed VI (who holds some of Essaydi’s pieces in his private collection), she lives in New York City and works from her family home in Morocco, a large and elaborate house dating back to the 16th century. The portraits she shoots inside — always of women — recall 19th century French depictions of Arab concubines, popularly known as odalisques. 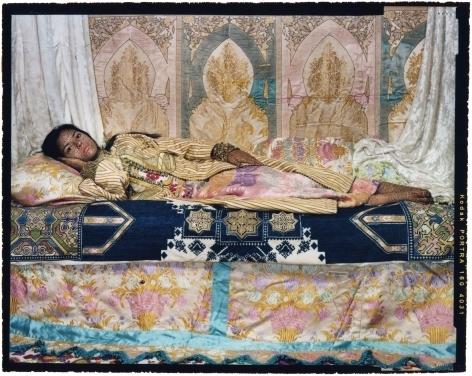 In Essaydi’s portraits, you can see the ghost of the naked odalisque — objectified even in being termed. But Essaydi’s women show little flesh. They gaze into the camera, as if challenging the viewer directly. Some look positively regal, like the women in her “Bullet” series, who wear a sort of chain metal she fashioned out of flattened bullets. 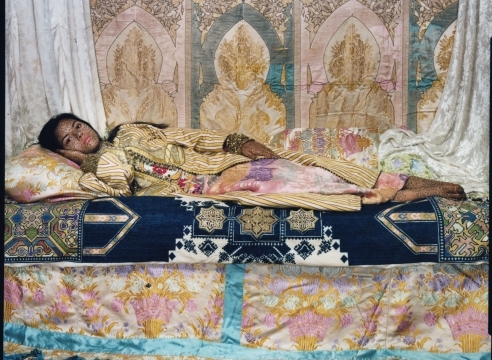 For the past six years, Moroccan-born photographer Lalla Essaydi has labored over a body of photographs made in a large, unoccupied home in her native country. She splits her time between Morocco and the U.S., transporting materials ranging from fabrics to bullet castings to a property owned by her family. 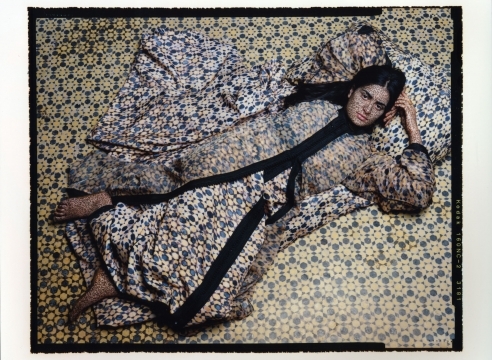 The house is not just a distant studio space, though; it is a vital part of the narrative in Ms. Essaydi’s images that explore the Arab female identity. The vacant family home where her photographs are made once served as disciplinary space, where a young woman was sent when she disobeyed by stepping beyond the “permissible space.” The woman would spend a month alone in the house, where she was not spoken to by anyone, including the servants who were her only company. Middle Eastern women, supposedly powerless and oppressed behind walls and veils, are in fact a force in both society and the arts. They played a major role in the Arab Spring and continue to do so in the flourishing regional art scene — specifically in photography — which is alive and very well indeed. Some Middle Eastern photographers have taken their cameras to the barricades, physical ones and those less obvious, like the barriers erected by stereotypes, which they remain determined to defy. 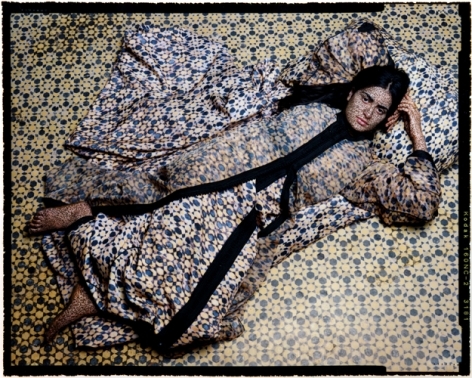 The Museum of Fine Arts, Boston, takes note in “She Who Tells a Story: Women Photographers From Iran and the Arab World,” an ambitious and revealing exhibition of work by 12 women, some internationally known. 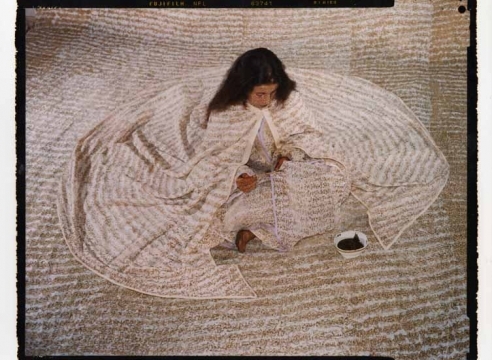 ''She Who Tells a Story," at the Museum of Fine Arts Boston, is unlike any contemporary art show at the moment. Bringing together photographs and videos by 12 women from Iran and the Arab countries, it introduces issues and names that will be unfamiliar to audiences in the U.S., even among the highly informed. 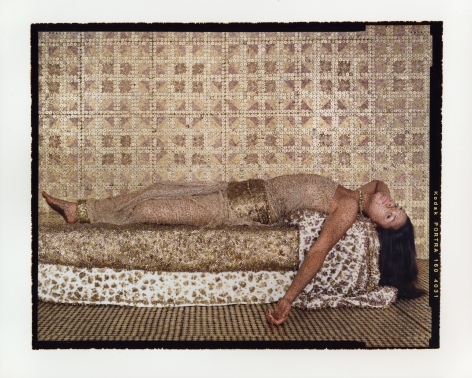 Opening the show is Ms. Essaydi's three-part photograph of an elegantly dressed woman lying on a bed in a tiled room. Only on close inspection is it apparent that the golden tinge of the image, with its air of luxe et volupté, comes from hundreds of metal bullet casings used to construct the mosaiclike décor. Relying on the illusion of trompe l'oeil, and poses that refer to icons of Western painting by Ingres and Klimt, she has cleverly—maybe too glibly—asked her audience to question the supposed truth of photographs. 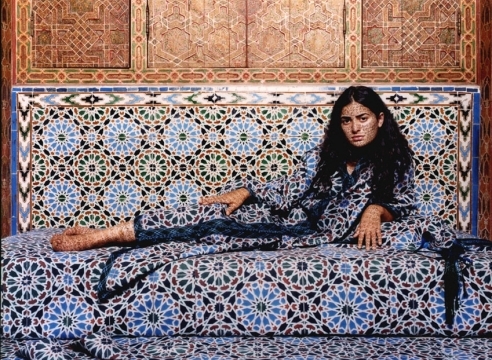 Moroccan-born Lalla Essaydi always knew she was going to be an artist. Her father was a painter, and some of her fondest childhood memories include drawing with colors and pencils in his studio in Marrakesh. 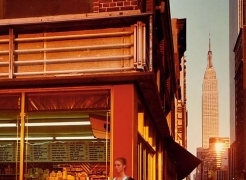 It wasn't until a journalist spotted her photographs decades later while she was a graduate student at the School of the Museum of Fine Arts in Boston that she began to gain international attention. 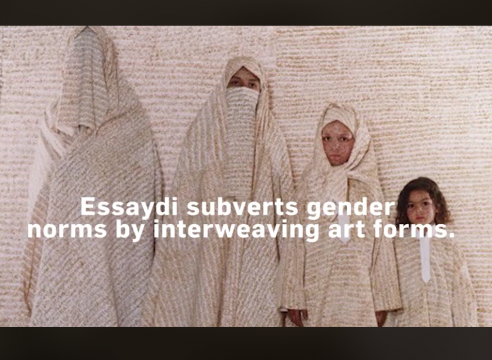 Essaydi, who also lived in Saudi Arabia for many years and now lives in New York City, has had her work exhibited across the United States, Europe and the Middle East. 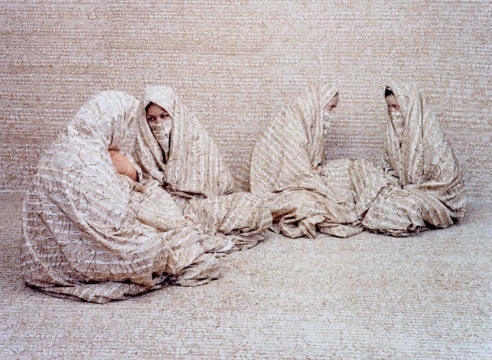 Known for her large format photographs, her work combines Islamic calligraphy and representations of the female body, focusing on the interconnection of faith, culture and gender, and challenging notions within all three. Her photographs feature women dressed in fabric inscribed with henna calligraphy posing in front of abstract backgrounds that utilize the same cloth and script. She sees her work as "intersecting with the presence and absence of boundaries; of history, gender, architecture, and culture; that mark spaces of possibility and limitation. That is my story as well." 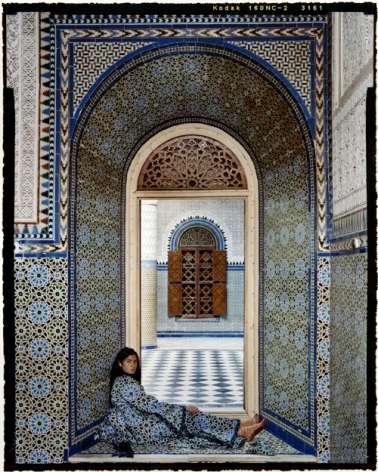 The young girl growing up in a harem in Morocco is sitting alone in an abandoned house surrounded by olive trees. For one month, the girl will speak to no one and be spoken to by no one. This is her punishment for “stepping outside the permissible space” and rebelling against rules that give her brothers more freedom. Confined to this lovely but deteriorating house, attended only by servants, a young Lalla Essaydi begins to think about the private spaces that women in the Arab world must inhabit. 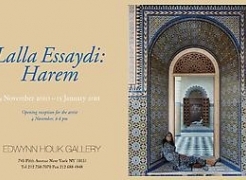 It is this place of punishment to which Essaydi will return decades later to understand the artist she has become. Her work, she says, will become haunted by spaces she inhabited as a child. An interview with Lalla Essaydi about her work and its relation to the current situation in the Middle East. 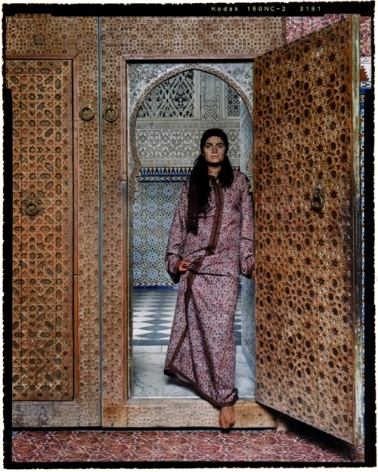 Galerie Edwynn Houk zur Stockeregg is delighted to present an exhibition of photographs by Moroccan-born artist, Lalla Essaydi. 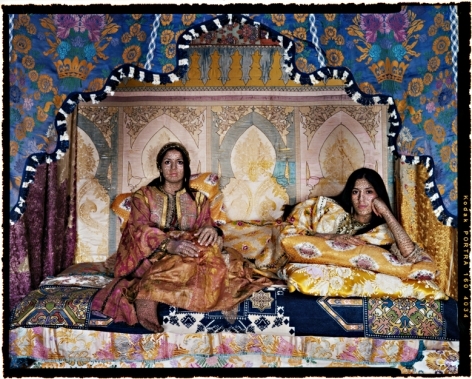 The show will include work from two recent series: Les Femmes du Maroc (2005-2008) and Les Femmes du Maroc Revisited (2010). 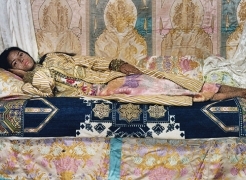 This is Essaydi’s first solo exhibition in Zürich.